On Friday 15th February 2013, amateurs and professional astronomers put their eyes on the near-Earth asteroid 2012 DA14. The approach of this small object (estimated size ~ 50 m) to the Earth was the closest ever predicted. During this event the object was at about 27.700 km above Earth's surface, which means it was inside satellite's geostationary orbit (~ 35.800 km). Although fly-by of the Earth by objects of the size of 2012 DA14 are not so rare, the short distance made it an unprecedented occasion to learn about these small objects. According to N. Pinilla-Alonso, who is an asteroid expert and user of the TNG: "Close approaches of asteroids to the Earth are interesting events; the object can potentially break up due to tidal forces if it reaches the Roche limit. Besides, in general, interchanges of momentum between the Earth and the approaching body can alter their orbits and cause the object to tumble." A group of planetary scientists chose TNG to observe 2012 DA14. Observations were not trivial. TNG pointed to the object some hours after its closest approach, when its orbit was still within the Earth/Moon system moving at very high speed rate, ~ 1arcsec/sec. After a successful run, the researches faced the process of reduction and analysis of the data. "This object was not very well known before the approach in 2013. Nothing had been published in pre-reviewed publications. 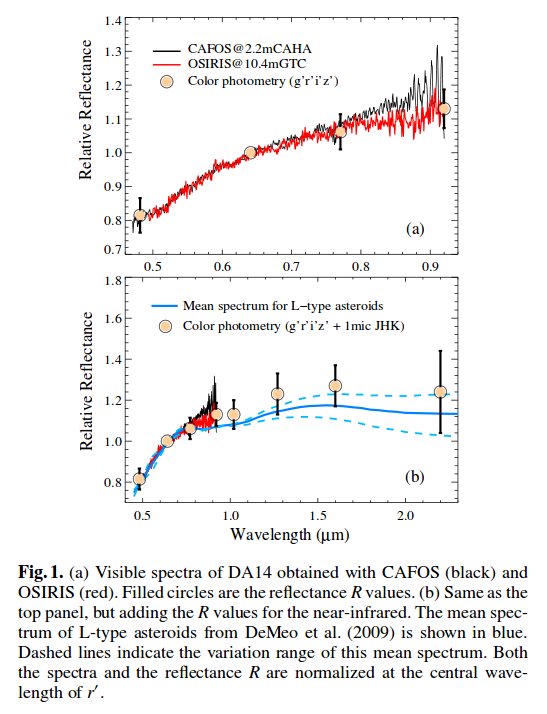 Observations from optical and near-infrared telescopes were necessary to shed light on the rotation characteristics and on the composition of the asteroid. We were amazed by this great opportunity", says Vania Lorenzi, support astronomer at the TNG. An other researcher of the group, Julia de León Cruz adds: "The obtained data allowed us to have an idea of the minerals present on the surface of the asteroid, mostly silicates and carbon. We found that the asteroid is probably smaller (20m) than it was previously estimated, and that the closest approach to Earth seems to have changed its rotational period from 9.8 hours to 8.95 hours, i.e., causing a detectable spin-up." Paper published on Astronomy & Astrophysics , vol. 555, L2, 4th July 2013. The scientists of the group thank the TNG staff for the observations. TNG contact person: Gloria Andreuzzi, email , tel. (+34)-922-433645.